We at Bloggers table were at Varq restaurant of The Taj Mahal Hotel, and it was after a long long time when we were all attending it together. 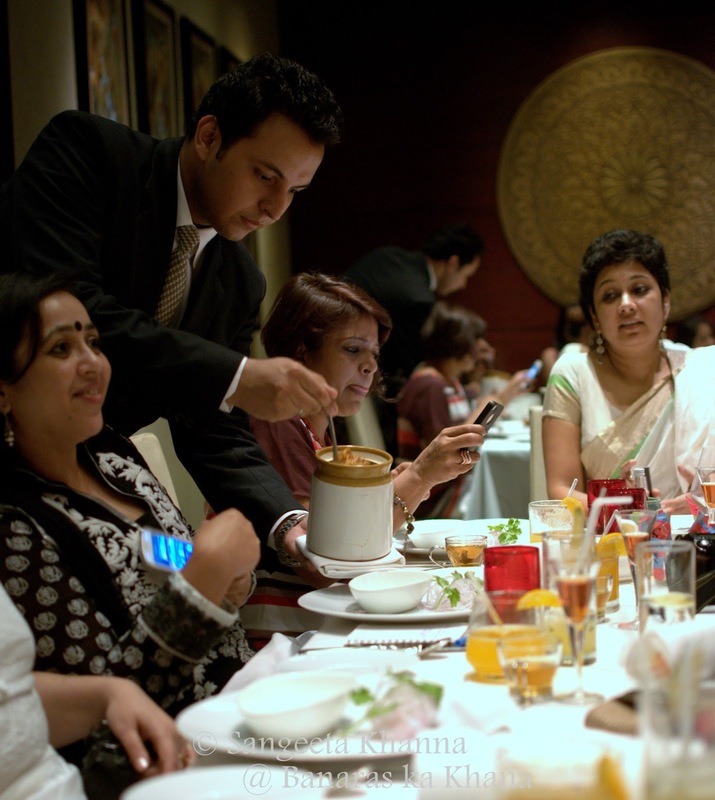 Ruchira had a hand in it as she made us cancel a farewell that was planned for her and made us all to come to Varq. She is someone who would orchestrate her own farewell so it is convenient to every single person attending. Yes she is moving to a new country and we are going to miss her badly.. And she made sure to make us all weak in the knees by her gestures and surprises that day. More about that later, we will talk about the interesting dinner we had at one of the best known contemporary Indian fine dining places. A warm mystic decor greets you when you enter Varq with black, red and gold accents. We were seated in a private dining area and the service was very very good. The mocktails were served which followed by a 'hibiscus tea' and then the amuse-bouche. 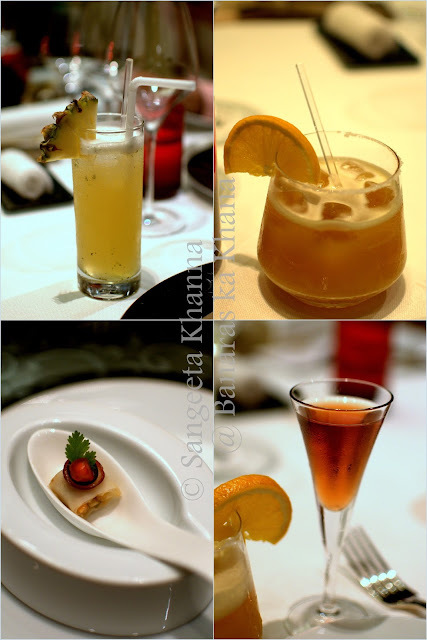 I loved the orange juice and tamarind drink and had a second glass, my drinks ended there as I was not in a mood for any alcoholic drink. Had a sip or two of the curry patta martini from Sid's drink but decided to stick to my own OJ-tamarind mocktail that kept me good company. I tasted the pineapple and basil drink as well but it tasted like pineapple juice only, no herb flavors came through the drink. The 'hibiscus tea' that was served, was actually kokum extract, the infusions probably got mixed up in the kitchen owing to their similar colors. That could have been avoided. A place that is frequented by many foreigners can give a wrong notion regarding our native foods and drinks if such goof ups happen. 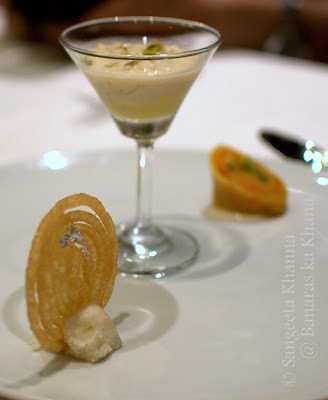 Amuse-bouche was a tiny portion of chaat flavors and nice textures. A really good idea in fact. 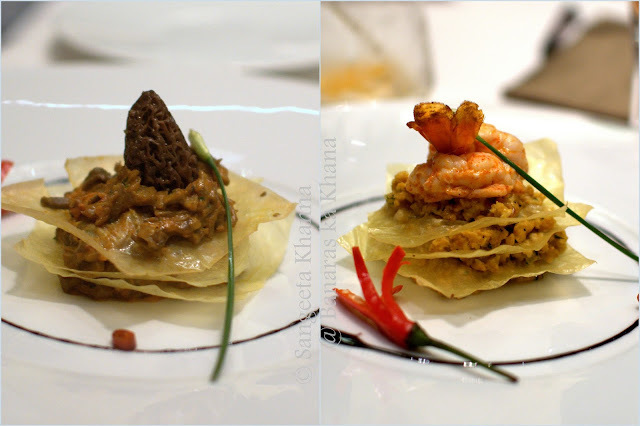 Varqui crab came as an appetizer which was layers of crab meat on crisp filo sheets topped with a tandoori shrimp. I quite liked this with it's presentation as well as taste. Succulent crab meat scramble which was mildly curry flavored and a plump grilled shrimp. Filo sheets did nothing to the taste but made a nice garnish. The vegetarian equivalent to it was Varqui khumb which had minced mushrooms instead of crab meat, topped with a morel. Next came the haleem aur kabab platter which looked awesome and kept the promise too. I liked the melt in the mouth type galauti kabab, the creamy haleem rich with caramelized onions and a very interesting ganderi kabab. Ganderi is a piece of sugarcane literally, this kabab was a seekh kabab wrapped on a thin but firm sliver of a sugarcane stick. This ganderi seekh kabab was dipped into a sweet and sour tamarind chutney served in a shot glass. A spectacular kabab that would leave you wanting for more just because of the chutney and the ganderi. An ordinary seekh kabab served spectacularly I would say. The palak patta chaat was really interesting with crisp fried palak patta and miniature palak pakodis smeared in sweet and sour tamarind chutney. We did sneak a few of them from our vegetarian friends. Rekha and Sushmita are vegetarians in the group. 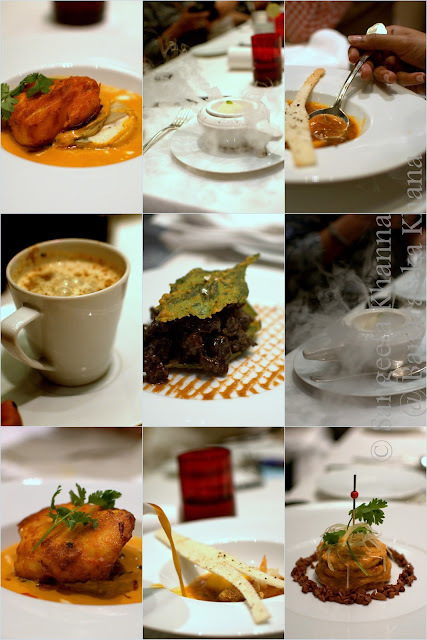 The next course was a lobster rassa for non vegetarians and a kala chana cappuccino for vegetarians. While kala chana cappuccino was outright awful, I quite liked the lobster rassa. A goan curry style broth that had potent flavors of seafood, that means a good stock was used. I liked the robust flavors and the warmth in this broth. Those who hate seafood smells should stay away from this, I would warn. This one is for those who love seafood. A palate cleanser arrived with much drama. A ginger sorbet served over dry ice as we followed the trail of smoke. I am not sure if ginger is a good palate cleanser but I liked it. Sea bass on spiced potato dauphinoise was the next course I had chosen. It looked good, I liked the pan seared fish but the potato dauphinoise didn't seem to go well with the mango and coconut milk curry. It felt like confused flavors struggling for attention, although it was a nice creamy curry. I knew Charis was loving it, probably Parul too as I know how much she loves fish in coconut milk curry. This was the curry I felt was wrongly combined in terms of food elements. Sour mango, cream and coconut milk make opposite food groups, not very kind on our system. Kali mirch ka murgh was also a dull flavored chicken as I tasted some from Deeba's plate. 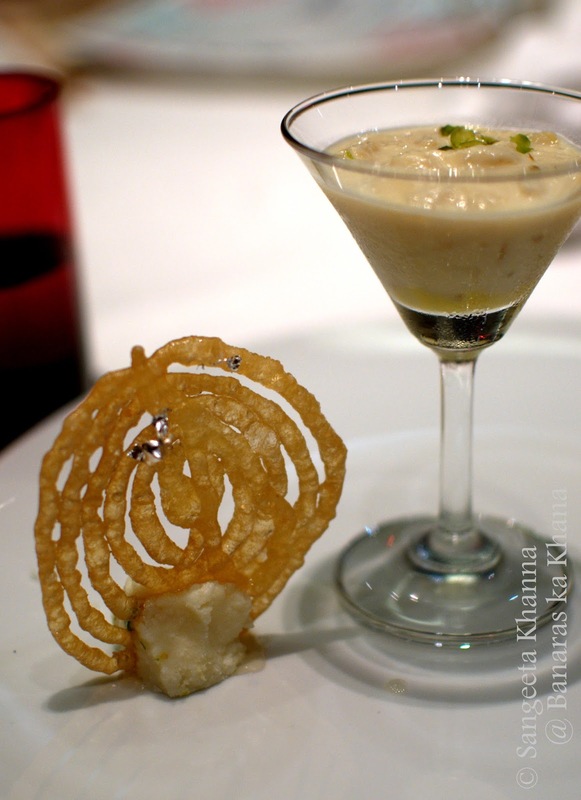 Sushmita decraled the jaitooni malai paneer a disaster, though it was a stunner on the plate, plated really creatively. Kali mirch ka asparagus was on the menu but I doubt it was served. I would have liked it probably. I was full by now but a meat course was yet to be served. It arrived with much anticipation as martaban ka meat was cooked in ceramic martabans (crock pots) and was being served right from the martban. I loved this idea. The meat curry was a regular curry though, nothing special of martaban cooking I could feel, may be I was too full by then. I felt this course was too heavy for a last course. It was served with two vegetable accompaniments, a palak wadi and a urulai podimas. Both were good but a sheer wastage as by the fifth course no one was in a mood to enjoy them. 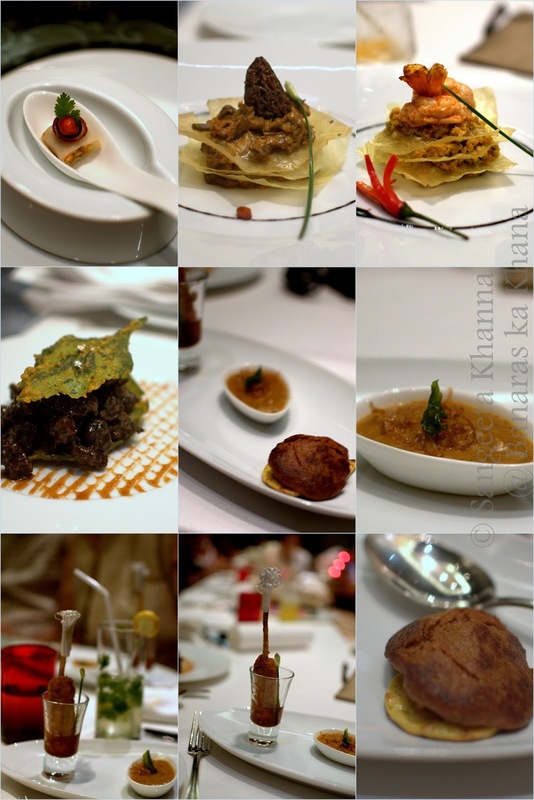 I quite liked the jaitooni naan and another stuffed bread served with this course. Ah, there was a pulav served with it too. A kofta pulav that had generous sprinkling of black grapes (or was it craisins? ), I found this pulav to be a medley of confused flavors too. But I know a few people who would love this pulav. I was too full by now, almost repulsed with the last course but the dessert really made us all happy. Jalebi, apple kheer and a rolled malpua. While the malpua was meh, the jalebi made me smile as I could eat the whole jalebi after years. The apple kheer was wiped off quickly too and I got up as there was no more scope of stuffing myself with any more food. The serving team brought another platter of a beautiful decorated chocolate dessert that looked like a globe with silver foil maps. 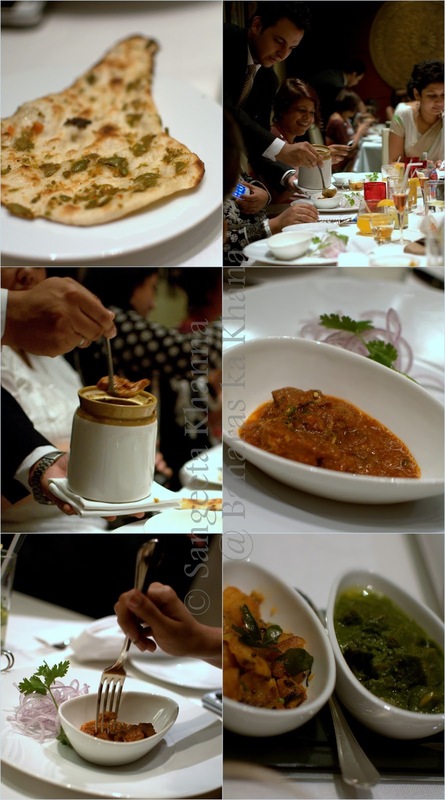 It was flambeed on the table, we were all stuffed but few of us took a small spoonful of it before walking out. Deeba had joined us all at the table after a long time. Himanshu and Mukta were also part of this table. Nachiketa joined us all at the last moment as she recently returned from her stint at Le Cordon Bleu, London. We caught up with everyone in the last as some of us were seated quite far away from each other and then quickly made an exit as it was quite late in the night by now and we were all returning alone. I would recommend this place if you want a cozy private fine dining experience with family or guests and don't mind the expenses, otherwise there are nice Indian food restaurants in the city serving good value for money. I love how we all got different angles depending on out seating. Well done. That was a lot of food that night. interesting write up and awesome pics! !